We thank KASSI Catering, who hosted the event and also provided the luncheon buffet, and Whitney Benefits. 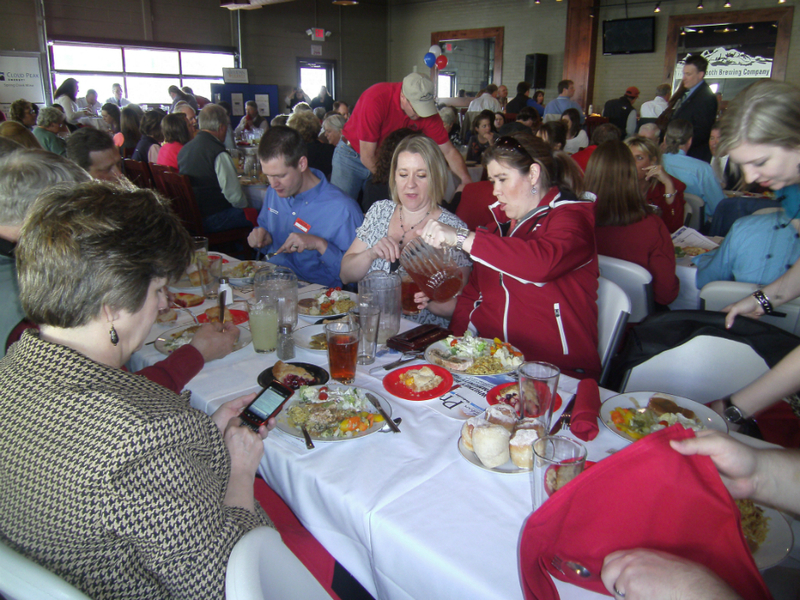 who gave the program, for another terrific Chamber luncheon yesterday. Thanks also to Black Tooth Brewing Company for providing the new and unique location. More than 120 Sheridan County Chamber of Commerce and guests heard Whitney Benefits President Tom Kinnison talk about scholarship opportunities at the chamber’s luncheon Wednesday at the Black Tooth Brewery. Kinnison said area high school graduates and GED recipients are eligible to apply for loans from Whitney Benefits. Today, Whitney Benefits’ loan program is offering support to 379 full-time college students. In keeping with the educational goals set out by the trust, Whitney Benefits also supports Sheridan College in the form of monetary donations. Those donations are used to build new facilities and to support various programs. The newest donation is in the form of $7.6 million for the construction of a new academic center at Sheridan College. The state of Wyoming matched Whitney Benefits’ donation. According to Kinnison, state Sen. Bruce Burns, R-Sheridan, as an avid supporter of the project. Kinnison thanked Burns for his support of the project at the luncheon. Kinnison estimated construction of the academic center will bring 200 jobs to Sheridan. Kinnison said interested persons can learn about the history of Whitney Benefits and of Eward A. Whitney in two books released by Sam Western and Whitney Benefits: Solace in Numbers: A Biography of Edward A. Whitney and The History of Whitney Benefits. The next Chamber luncheon is April 11 at the Holiday Inn.